What better way to go to bed than to climb into a preheated haven of rest and sleep. Far better than getting in and shivering waiting for the bed to heat up right? Absolutely, that’s why elecetric blankets are the way forwards. But finding the best electric blanket can be difficult, which is why I put together this guide, I’ve looked cost, safety and of course reviewed all my favourites so you can order yours today from Either Amazon or John Lewis. Here’s a quick run down so you know what to look for. There are two types of electric blanket. A heated throw which you can use on top of the bed and a heated undersheet which you put underneath your bed sheet. Heated throws are great because they are easy to remove and you can use them while you’re sitting in the living room if it’s especially cold. But undersheets give you a warmer bed to climb into as all the heat gets trapped under your duvet and in the mattress keeping your bed warmer for longer. And if your bedroom tends to be cold then nothing beats climbing into a nice warm bed. 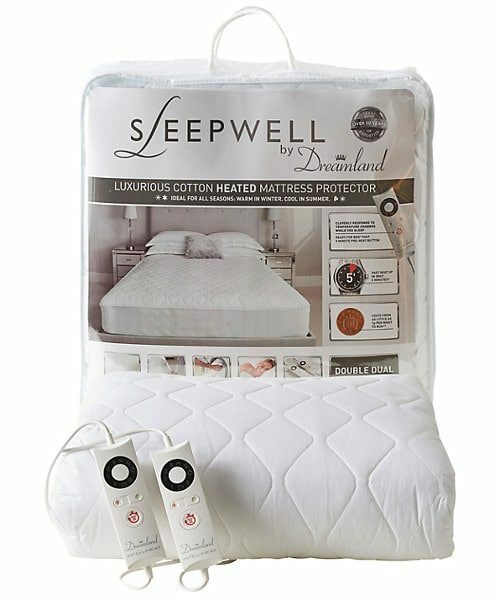 Are electric blankets safe to use or is there a fire risk? With a new electric blanket, yes they are completely safe. Dangers come from old blankets that have been overused and become worn so you always want to make sure your electric blanket is completely faultless. Tie tapes damaged or missing. An old BEAB safety mark – a round symbol (the new sign is white capital letters on a black background). This means it is more than 10 years old. If in doubt buy a new one! It’s not worth the risk to not get it replaced. 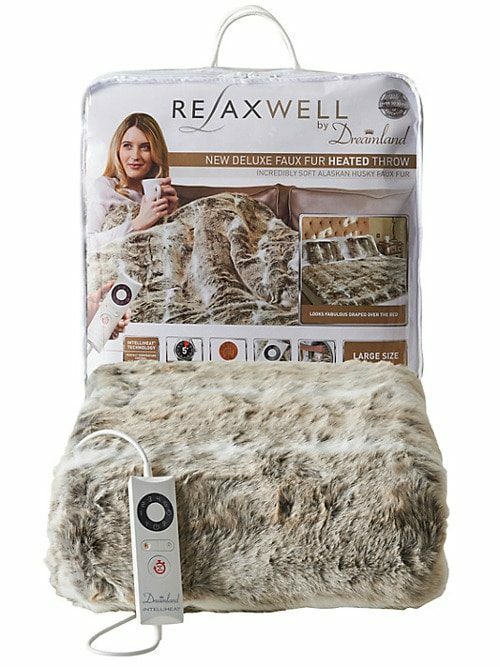 Luckily hundreds of thousands of people use electric blankets every year without incident so you don’t have to worry when you buy any of the electric blankets recommended here they are completely safe. Electric blankets are actually surprisingly cheap to run. For one thing, you use them when during off peak times so your electricity costs less and the power consumption itself isn’t much more than that of a couple of lightbulbs. So you could potentially only be spending 3 pence per night or less on your electric blanket. A small price for a cosy night’s sleep! Which! did a test to compare the cost of running various electric blankets and the least efficient one after being run every night for two hours over half a year cost a whopping £8.06. Nothing compared to what I’m sure your electricity bill is normally if yours is anything like mine! Can you use it with a mattress topper or memory foam? You can use an electric blanket with a regular mattress topper but not with a memory foam one. Or a memory foam mattress for that matter. But what you can use with memory foam is a heated throw, they lie on top of the bed and if it’s got the duvet and yo ubetween the bed and the memory foam you’ll be absolutely fine. Now that we know the two types of electric blankets we can get to the good stuff and I can tell you the best electric blankets available! This electric blanket is next level when it comes to a cosy nights sleep. Its got 6 different temperature settings and dual controls so you can control each side of the bed independent of the other. Plus it’s a fitted mattress protector so you there’s no way it can slide around under your sheet and end up bunched up anywhere. Plus if you don’t keep it turned up all night it can cost as little as a penny a night! That means you could use it every night for a year and it would only cost you as much as a festive latte. There is also an easily selected automatic shut off which can be set to one hour or nine hours. This means you won’t be coming home from work to realise you forgot to turn it off or waking up a few hours later feeling rather sweaty! All that makes this the best electric blanket you can buy. I don’t know a single couple who share the same sleeping habits there’s always one who’s a morning person and the others a night owl, or more often one who spends the night shivering and the other who spends it sweating! Well, help is at hand, at least for the person who is shivering, you can get yourself a dual controlled electric blanket. This is an electric blanket that has two independently controlled sides so each person can control how hot their electric blanket is and even whether it’s turned on or not. Perfect to stop arguments about blankets and windows being open. The Dreamland above has this but so does this Homefront electric blanket. This has the added bonus of each side having two independently controlled sections so you can each control the temperature at your feet and your body separately. Pretty cool right? There are also 10 different levels of heat control so you can tweak it until you’re just right. And it has a couple of great safety features built-in, it has overheat prevention so that it automatically shuts down if it gets too hot but it also has a timer so it will shut off after either 1, 4, 8, or 12 hours depending on your preferences. Having it on for 8 or 12 hours is a little excessive and will make you quite likely to overheat in the night but 1 or 4 hours is great. You can then unplug the controls and put it straight in the washing machine which is awesome, just be sure to follow the on-pack instructions! This fleece electric blanket is perfect for couples who tend to squabble over room temperature and blankets, you can both sleep comfortably without disturbing the other. Electric throws are a fantastic invention, who doesn’t love the idea of sitting on the sofa with a movie on and a hot chocolate snuggled under a soft heated throw? Bliss. But also if you have a memeory foam mattress or mattress topper you can put this over the bed and it won’t affect the memory foam underneath keeping you warm and comfortable all night long. 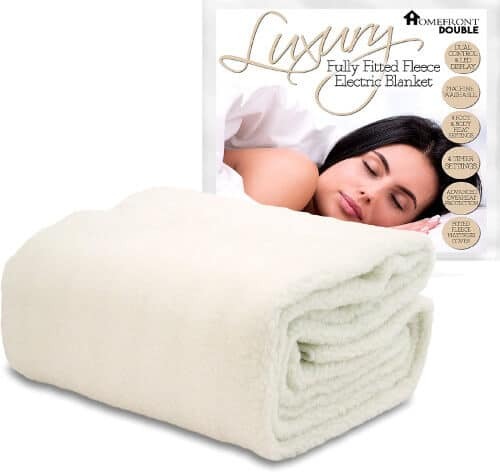 Dreamland do an excellent heated throw made of luxury faux fur that is super soft and snuggly. It’s like having a big fluffy bear giving you a warm hug while you’re watching TV. It has a nice long controller lead so you don’t need a plug right near your sofa. The controller is also removable you can stick the throw in the washing machine. It’s also got an automatic turn off after three hours for peace of mind. A wonderfully soft and comfortable throw great for relaxing on the sofa with. Or how great would it be to wrap up in this while you’re off work sick? Electric blankets come in all shapes and sizes but the cost is always a factor for many so I checked out some budget electric blankets for those who are stretched a little thin. 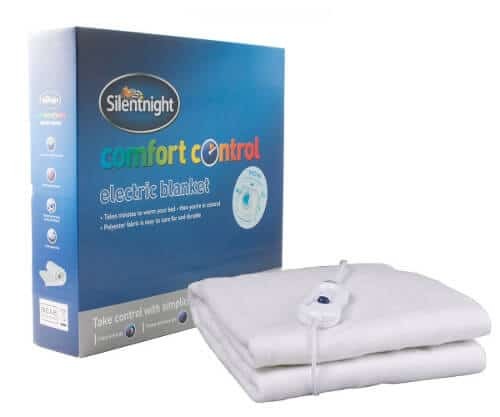 Silentnight have a fantastic budget electric blanket which is a great all-rounder. It’s got three heat settings and is available for single, double or king-size beds. I’m not a fan of the fact it doesn’t come with any sort of automatic shut-off timer but it does have overheat protection which is good. The other disadvantage of not having an automatic shut off timer is that if you don’t turn it off when you fall asleep you’re almost guaranteed to wake up in the night too hot and needing to turn it off. While this isn’t the worst thing in the world it disturbs your sleep and will make you more tired in the morning. An alternative solution to this is to get an auto timer for the wall socket so you can control when it gets turned on and off again. If you’re buying an electric blanket for your child then you want to make sure it’s safe. The best way to do this is to get an electric blanket with a timer. 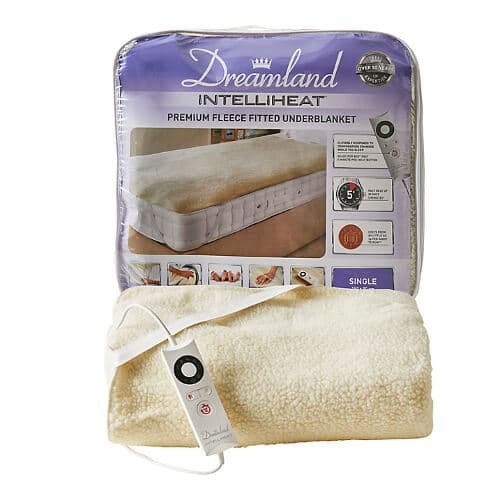 Dreamland do a single electric blanket that has a great 3-hour timer you can set to automatically turn it off. It’s also fitted for easy removal from the bed and you can wash it which is handy. Depending on the age of your child I’d recommend you turn it on 15 minutes before they get into bed and then turn it off for them when they get into bed so that it doesn’t get left on and they overheat and have a disturbed sleep. If it doesn’t get turned off when they get into bed then it will turn off three hours later so there is no danger whatsoever. If you’re buying an electric blanket for you child then safety is the number one concern. Never skimp on safety it’s just not worth it. So for the best electric blanket you need one with an automatic shut off timer. And that concludes all the best electric blankets! If you feel I’ve missed anything leave a comment below, I always try and keep all my articles up to date but with your he,lp it’s even easier. Thanks guys! Do you know of any electric blanket maker who makes a double size electric blanket with the controller on the left side and extra warmth for the feet? I do not want to flip or re-orient the blanket but would like one specifically to suit my bed which is against the wall on the right hand side. Seems like such a simple request but I’m surprised just how difficult this is proving to be. Hmm that is a tough one, I’ve not come across one like that before but if I ever do I’ll be sure to come back and leave you a comment here. Likewise, if you end up finding one yourself please share it with us! If you want the connector on the left side all you have to do is turn the blanket around 180 degrees. It means the switch will be at your feet rather than your head but at least it’ll be on the correct side! My partner and I have two single beds pushed together so that we don’t disturb each other when we turn over in the night. So we are looking for two single electric blankets. The problem is that they all appear to have the controls attached to the right-hand side of the blanket. That means that on one of the beds, the controls will be between the two beds. Do you happen to know of any single underblanket that has the controls on the left? If you turn the blanket around the control will be on the other side. It means the control will be at the bottom of the bed instead of the top which is a bit of a pain but better than no blanket at all. Also if you ever decide you want a double bed again but don’t want the movement you can get a memory foam mattress that’ll absorb any movement from your partner. I believe that’s a safety feature on newer electric blankets because there aren’t any blankets I’m aware of that work that way. So I’m afraid your only option is to go into your bedroom and switch your electric blanket on before you go and brush your teeth and get your jammies on, that way it’ll be warm for you getting into bed. Sorry I couldn’t be more useful!